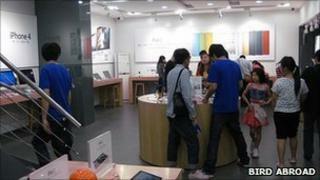 An American blogger has discovered three fake Apple stores operating in Kunming city, China. Pictures of the stores, their staff and a description of a stroll around them was posted on the BirdAbroad blog. In the article, she writes about conversations with staff, many of whom were convinced that they were employed by the US electronics firm. On her blog, BirdAbroad described the stores as a "beautiful ripoff - a brilliant one - the best ripoff store we had ever seen". She describes how convincing the shop was at first glance because so much trouble had been taken to copy key elements of a real Apple store. For instance, it has a winding staircase, upstairs seating area and employees wearing blue T-shirts and chunky ID lanyards. On closer inspection, wrote BirdAbroad, the store did not seem to be constructed to a particularly high standard. The stairs appeared to be poorly put together, the walls were not painted properly and, most damning, it had the words "Apple store" written on the shop front. "Apple never writes 'Apple Store' on its signs - it just puts up the glowing, iconic fruit," wrote BirdAbroad. Research by the blogger revealed that the only official Apple stores in China are in Beijing and Shanghai. A further check revealed that none of the three stores she found are mentioned on Apple's list of official resellers known to be trading in Kunming. What was also unclear was where the fake store had got the Apple products on sale - whether they had come from an Apple distributor or a grey market source.